Ken Tarman's '68 Cutlass S.
Here are some photos of my 1968 Olds Cutlass(S) Holiday Coupe that I found in 442.com's classifieds. I purchased the vehicle from a seller in Las Vegas NV. When I got the car it was stripped, primered all over and most of the interior was in need of being replaced. A lot of other work had been done and I felt that this one deserved to be restored. After the vehicle arrived in Va. my uncle Jimmy and I started taking parts off and getting it ready to be painted .With my uncle's forty-plus years of autobody experience he was a tremendous help getting the car ready. He went from one body panel to the next getting the sheet metal straight and working out all the bumps and bruises. We then took the car to a local Chevy dealership where it was painted Cadillac STS white diamond pearl. After the curing time had elapsed I trimmed her out with new body badges, scripts, weatherstripping, rubber, bumpers, bushings etc...(you name it !) I then took it to my friend Doug to have a new vinyl top installed and afterwards I reinstalled the stainless trim. The interior was next. But, to make a long story short, we replaced everything except the steering wheel and the original door panels ,which were in very good shape. 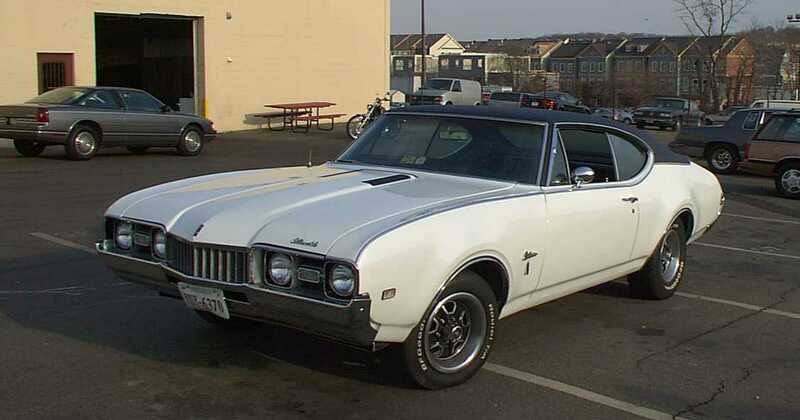 This Cutlass is powered by a 350 CID engine with an Edelbrock alum. intake manifold,750 cfm 4160 series Holley carb.,Lunati bracket master II cam,Unilite electronic dist.,MSD 6AL ignition, MSD blaster II coil,Comp Cam's 1.6 roller rocker retro fit kit,2 1/2" exhaust with flowmasters, sending a nice throaty rumble out through the trumpet tips and under the cutout 442/W31 style bumper.Oh,I also added the dual snorkle air cleaner assy. and under bumper scoops. The original 2 speed trans. has been replaced by TH 350 with shift and 3000 RPM stall converter which in turn is connected to a 3:23 stock posi rear. Recently, the front end suspension was was rebuilt and a front disc brake conversion was added, which made all the difference in the world. I really cant think of too much more to do at this point , except keep it waxed & polished and enjoy it ! I owe special thanks to uncle Jimmy who came out of retirement to help me ,Doug & Steve for the interior and front end help, Paul (The Painter) , and finally my wife Diana for being about as patient as I could expect her to be. The next one is a 70' Ragtop that she will probably drive more than anyone else.